When you buy well made items and take care of them, they will typically last. A mid-1990s leather jacket makes good example. Lands End, expert stitching, made in Korea, a solid product. I had to have one! At $157, the most expensive article of clothing I’d bought to date! Who would have known I’d still have it? Glad I ordered a size larger! After two+ decades my coat remains perfectly serviceable. Garnering accolades from all, the well-worn leather garment has been a solid investment. Life, however, is not without maintenance. A button resecured. Pete expertly replaced pocket linings ~ I scratch my head over his magic. The leather? Dry here, cracked there, discolored in areas. I tried a few reconditioning products. Foam had its chance. Expensive and uneven. A couple of years later, liquid spray. Well, that was a mess. Oversaturated, gummy, plus the spray gets everywhere! Pete inadvertently provides the solution. I repaired his bouzouki and was most happy with Behlen’s nitrocellulose spray finish used on the instrument top. An American Toolbox article ensued. Behlen parent company Mohawk became aware. Their social media guru reached out with thanks and offers of sponsorship and product. Banner ad? Sure! Product? You bet. I chose products for which I had use. Mohawk dropped them on my doorstep. No strings, no expectations, no editorial review. Except badgering from their legal eagle, who wants me to stress I received FREE PRODUCT FROM MOHAWK. A subtle reminder I pass on to you. Mohawk leather products come different ways. Leather Protector Wipes are chosen. At this point, keep it clean and let it age. The protector is delivered via pre-moistened towelettes. Easy to apply, good coverage, nice smell. Perfect amount of wetness. Very neatly done, Mohawk! Wow, WHO KNEW the leather was so filthy! My jacket gratefully sheds misapplied waxes, dirt, grime, and oils. Absorbs the Magic Mohawk dose of goodness. I’m GENUINELY pleased with the reborn look and feel of the leather. Maybe I’ll wear it one more time this season. Soon my beloved coat shall pass to the next generation. My nephew will look so cool in it! Pete the tailor has been a friendly acquaintance for years. The first time? Bringing in a treasured garment for repair, I politely ignore his “No new customers, please” sign. We share bonds of musicianship and craftspeople. I fixed an old guitar his kids trashed, two hours on a $5 guitar. He was ecstatic. He’s Greek, from Greece, and owned a genuine bouzouki bought in the home country decades ago. 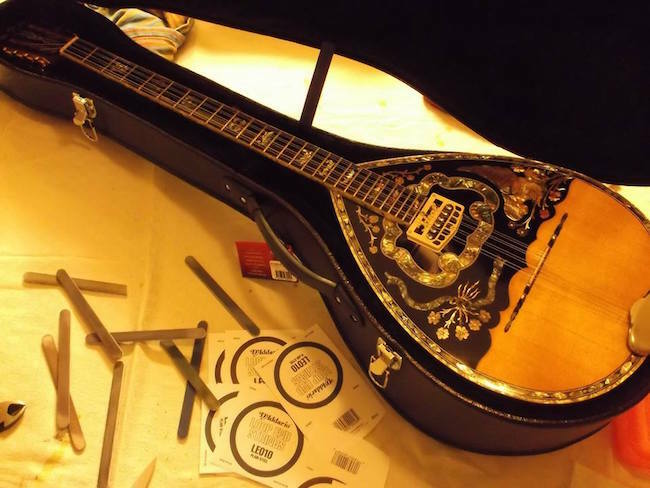 I was asked to fix his treasured bouzouki after years of hinting and delay. So Pete, he finally let me give it the old college try. Unlike college, I did finish the bouzouki. With its cracked top requiring a new lacquered finish, I tried a nitrocellulose spray made by Behlen. Parent company Mohawk came into my orbit while I spread the word on social media. Then came more product after, actually, I wrote a second materials-related piece, Behlen Hide Glue. Then came Buffer’s Polish, Fingerboard Oil , and now, the leather conditioner. ATB’s coveted “Six Thumbs Up” is proudly bestowed upon Mohawk. This entry was posted in Product Review and tagged Mohawk Leather Conditioner, Mohawk Leather Protector Wipes, pete the havertown tailor.